Tim Dahle Nissan Bountiful proudly serves drivers in Woods Cross and West Bountiful, UT with plenty of Nissan options. Whether you want a sleek pre-owned Nissan 370z or a premium new Nissan Sentra, we have what you’re looking for. You should always choose the dealership that’s dedicated to providing a world-class car-buying experience. 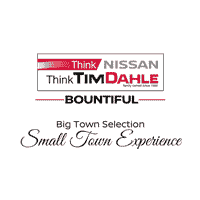 The sales professionals at Tim Dahle Nissan Bountiful know cars and know what you need. We will walk the lot with you and explore your new or used Nissan options. All you have to do is show up! When you’re looking for a new Nissan vehicle for sale in North Salt Lake, UT, we’re sure financing will cross your mind. Skip the long lines at the bank and apply for financing online from the comfort of your own home! That’s right. All you have to do to start the process with us is apply online. Everything is simplified with our Nissan dealershsip because we want you to have a stress-free experience. Have questions? Contact our finance department about your debt-to-income ratio or credit score. We’re happy to help! We want you to know that you can still count on us, even after our sale ends. Bring your new or used Nissan car back for your routine maintenance requests! We’ll gladly handle your oil change. Our certified automotive technicians have a quick turn around time and are ready to serve. Visit our service department near Woods Cross, UT now.